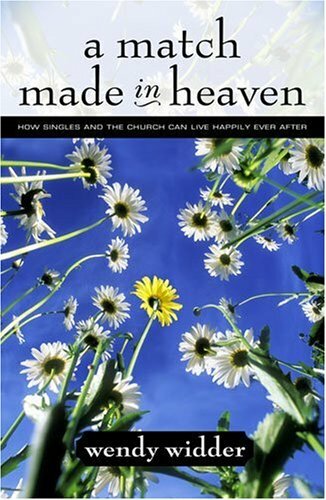 Home > Book Review > Book Review: Singles and the Church: A Match Made in Heaven? I think I will send him a copy of Wendy Widder's new book, A Match Made in Heaven: How Singles and the Church can Live Happily Ever After. In addition to helping single people, I believe the book could benefit pastors and church leaders in their understanding of single church members. Throughout the book, Widder asserts that today's church is broken when it comes to singleness. But she holds both singles and the church responsible for not treating each other with respect and dignity. She makes great effort to show that God loves everyone and desires a relationship with each of us, whether we are single or married. The book also demonstrates how an understanding of the Bible (and biblical equality) affects relationships with others. Widder discusses Adam and Eve and develops the redemption story. She believes singleness is a result of the fall. She uses Christ's life as an example of the single life, but points out that Jesus "actually talked very little about marriage and family, giving us scant material to use as a how-to manual for single living." She believes the church needs to understand and love singles, and singles need to understand and love those who are not single in the church. She intersperses appropriate stories of her own life and those of her friends. The book reflects Widder's strong belief that singles should not run from church to church for activities, but become bulwarks in their own churches. Sometimes singles have to seize the opportunity to serve in the church, she asserts. Perhaps the greatest strengths of her book are her suggestions on how singles can be a true part of the church, and what both the church and singles can do to accomplish this. Her endnotes include seven specific strategies for "singles who want to serve the body of Christ with the best of who they are and what they have." In addition, she includes ways in which singles can be an encouragement for childless married friends or empty-nesters. Overall, this is a much-needed resource for singles or any church that is struggling to reach out to unmarried people.